On Sept. 28 at Haddam-Killingworth, the co-op swim team of Lyme-Old Lyme and Valley competed against Haddam-Killingworth. Despite a strong performance by Old Lyme-Valley, Haddam-Killingworth won the meet in the end with a score of 76 to 61. Haddam-Killingworth came first in the 50 yard freestyle (Kiera Bragdon). Valley/Lyme-Old Lyme notched second in the 50 yard freestyle (Connie Pan). Valley/Lyme-Old Lyme divers Anna Donato and Britney Detuzzi earned Honorable Mentions in the 50 yard freestyle coming in respectively 5th and 6th. DEEP RIVER – The Region 4 Board of Education has acquired a 34-acre parcel of land adjacent to Valley Regional High School for $350,000. The transaction closed on Aug. 31, 2017. The Region 4 Board, consisting of three representatives from each of the towns of Chester, Deep River and Essex, voted unanimously to make the purchase. The First Selectmen in each of the towns were aware of the opportunity and all expressed their support for the acquisition. The purchase was funded with $350,000 from Region’s sinking funds, eliminating the need to bond or secure a mortgage. The sinking funds currently have a collective balance of $125,000. in three to five years. The opportunity was first presented to the board in February of this year, and the board voted to direct Bruce Glowac to enter into negotiations to purchase the property. After several months of discussion with the previous owner and a substantial price reduction (the property was originally listed at $500,000), a deal was reached. Superintendent Ruth Levy provided an update on the purchase at the September Region 4 Board meeting. AREAWIDE — Celebrate one year of open doors of the Deschapelles Community Library with world famous piano prodigy Ethan Bortnick. Don’t miss an exceptional opportunity to see this versatile, teenage piano prodigy coupled with a chance to support the continued education and programs offered by Sister Cities Essex Haiti (SCEH) for the community of Deschapelles, Haiti. Bortnick will perform at Valley Regional High School (VRHS) on Thursday, April 6, from 7 to 8:30 p.m. Adult general admission is $30 and student general admission is $20. Tickets are available online at this link. Bortnick was the youngest performer at the 2010 We Are the World for Haiti and has performed for and/or recorded with celebrities such as Elton John, Beyonce, Katy Perry, Josh Groban, Tony Bennet, Celine Dion, Andrea Bocelli and Gloria Estefan, and has been a guest on Oprah and The Tonight Show. Recognized by the Guinness World Records as “The World’s Youngest Solo Musician to Headline His Own Concert Tour,” pianist, singer and composer Bortnick has been performing around the world, raising over $40 million for charities across the globe. In this concert at VRHS, Bortnick will perform a range of music that appeals to people of all ages. Hear songs from The Beatles to Elton John to Broadway, from Chopin to Neil Diamond, from Michael Jackson to Motown to rock ‘n roll, works by great classical composers and everything in between. His show, The Power of Music continues to be one of highest rated specials on PBS. Sister Cities Essex Haiti is a non-profit organization established in 2010 after the devastating earthquake in Haiti and partners with friends in Deschapelles, Haiti to establish programs, which expand educational and cultural opportunities. The organization’s major project was the creation of a community library, which opened its doors in January 2016. The library has become an integral part of the community of Deschapelles and hosts a variety of programs for children and adults. Sister Cities Essex Haiti supports other projects including a musical collaboration among musicians and music lovers in southeastern Connecticut and Deschapelles, an early education teacher training project, a cross-cultural exchange project with students from CT, and a tennis project. Sister Cities Essex Haiti continues to engage in initiatives in southeastern Connecticut that increase awareness of Haiti and its unique culture. 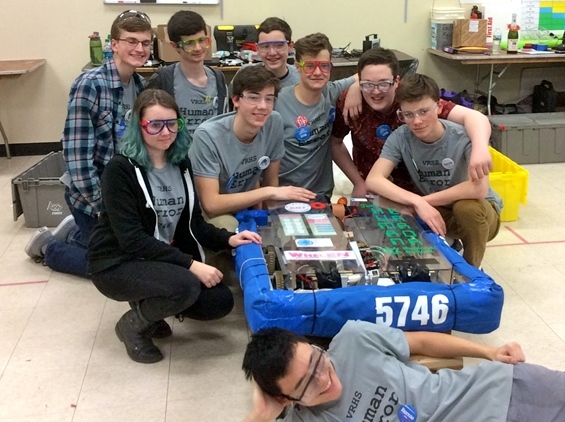 REGION 4 – Valley Regional High School was among 40 teams from Connecticut and Massachusetts that convened at two weekend-long First Robotics’ Competitions (FRC) New England held in March and April of this year. The April event took place at Hartford Public High School, April 1-3, and officials of the school said it was the biggest event in the state related to science, technology, engineering and math, or STEM education. In only their second year with a robotics team, Valley Regional High School’s “Human Error” took second place at the March competition held in Waterbury, beating out nearly 30 other teams. Then, on day one of the Hartford event, Human Error placed second overall but ultimately dropped in rank on the final day just missing the cut to advance. Last year Valley’s team was awarded Rookie of the Year. “It’s a little disappointing that we didn’t get picked for an alliance in order to advance, but we accomplished every one of our goals set for the robot we built and we all feel really good about that,” said Valley sophomore Rocket Otte. Being Otte’s first time with the Valley team, he described the competition experience as “electric” and “exciting” and like no other. He explained he really appreciated the spirit of cooperation among all the teams. Valley’s team Human Error, made up of about 30 students, spent more than 200 hours working after school and on weekends to build and refine the robot’s functionality. Each member or specific group works on a particular aspect of the robot, from sensors, to gears, to bumpers to programming, using math, science, logic and other educational disciplines. But the key is teamwork. “Working collaboratively and coordinating skills and talents is what happens in this space; students determine themselves who does what to get the robot working, they organize themselves; the other teachers, mentors and myself are on the sidelines offering guidance and support when needed,” explained Valley Biology teacher Dr. Peano. Another key element to the team is programming skills. This year that effort was led by rookie member and sophomore Sam Paulson, who worked in the Java programming language to accomplish the task of instructing the robot’s functions, programming it to drive and move its metal arm. “Programming is something I learned myself with online sites and it’s something that interests me, so when I joined the team I offered to work on that. I learned programming the robot to drive is easier than programming the arm to move,” said Paulson. In the end the competition was more than winning or losing. It was about brainpower, creativity, collaboration and having fun, all done in an environment outside the usual classroom setting. REGION 4 — Tri-Town Youth Services will kick off its three-week summer Co-op 2016 with “Water Week,” which will take place June 27-30. Each day will start at 9 a.m. and end at 4 p.m. at Tri-Town Youth Services, 56 High Street, Deep River. 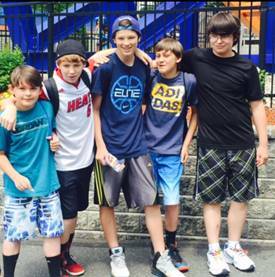 The week includes trips to Ocean Beach, Huck Finn, Brownstone and Lake Compounce. Session III, July 11-14, is “Equine Adventure,” which includes learning about horses, their care and riding lessons. Hours are 9:30 a.m. to 3:30 p.m. These programs are open to students entering grades 7, 8 or 9 who live in Chester, Deep River or Essex. REGION 4 – Tri-Town Youth Services’ 2016 Generativity Award was recently presented to John Proctor, Superintendent of Region 4 Schools, 1986-1998. John and his wife, Sherry, have been residents of Ivoryton since 1986, when he began his role of Superintendent of Schools here. Upon retirement, John held a position at UConn, where he supervised teachers as well as student administrators. Over the years, he has made numerous presentations on the Civil War. 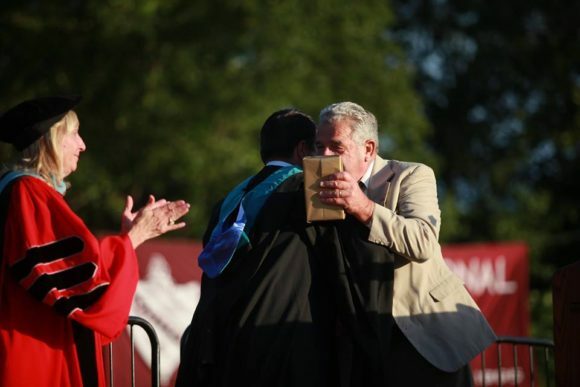 When John was Superintendent of Region 4 Schools, he said enthusiastically he was “here for the kids.” He made it a point to attend numerous school functions such as sports games, proms and banquets, and he was frequently seen in all schools. His philosophy holds that each child is an individual with unique expectations, strengths and needs. He believes students need to be informed, thinking citizens with well-developed character. Over the years, he promoted youth developmental assets, including diversity. He supported including social emotional programming in Region 4 schools. John Proctor has received numerous awards. In Region 16 he was named Educational Leader of the Year. A magazine, “Executive Educator,” named him as one of the best 100 small school superintendents. 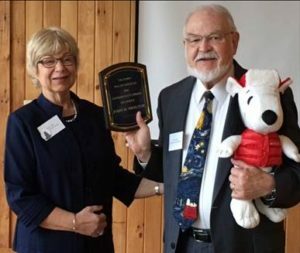 A professional organization, Connecticut Association of Public Schools Superintendents, presented him with their Emeritus Award for 45 years of service. Tri-Town Youth Services has presented a Generativity Award annually since 2005. Recipients of the award are people who, over time, have demonstrated an ongoing commitment to youth and have contributed significantly to building youth developmental assets. Previous awardees include: Marilyn Malcarne, Rick Stabbins, Pat Kosky, Jane Cavanaugh, Ingrid Walsh, Rev. Tim Haut, Linda Hall, Barbara Nidzgorski, Phil Miller, Dr. Ruth Levy and Michael Fearon. 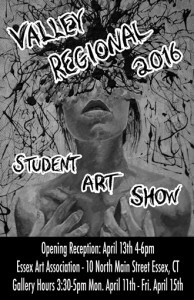 REGION 4 – The 2016 Valley Regional High School (VRHS) Student Art Show at the Essex Art Association will be open daily to the public the week of April 11 through April 15, from 3:30 to 5 p.m. The Essex Art Association hosts this show each year and gives away over $1,100 in prize awards to VRHS students. An opening reception was held Wednesday, April 13, from 4 to 6 p.m. All are welcome to attend. The Essex Art Association is at 10 North Main St., in Essex. The poster painting (shown on the left) was done by student Morgan Dinwoodie. REGION 4 – Last October, tri-town community members’ stories came to life in a play, “What Got Me Through,” on the stage of the Chester Meeting House. The production was the culmination of a year’s work: training a team of story gatherers, interviewing residents who shared their stories of overcoming challenges, the writing of the play by Jules Corriere, and then the theatrical production, led by Jacqueline Hubbard and performed and staged with local cast and crew, all with input also from Community Performance International. The play was a means of raising awareness about building developmental assets for youth and families in Chester, Deep River and Essex. Many lives were touched by the project. One performance was recorded. The screening of the video will take place on Wednesday, June 1, at 7 p.m. in the Valley Regional High School auditorium. It will be an opportunity to “see the play again” or, to see it for the first time if you missed it last October. For further information contact Tri-Town Youth Services at 860-526-3600. 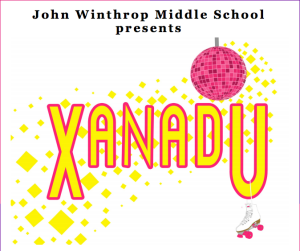 AREAWIDE — Region 4’s John Winthrop Middle School in Deep River presents “Xanadu Jr.” on Friday, April 1, and Saturday, April 2. Both performances are at 7 p.m.
With over 60 students involved, “Xanadu Jr.” promises to be an energetic, family-friendly performance. The plot follows Greek muse Kira as she helps surfer Sonny with his dream to create a roller disco in 1980 Venice Beach, Calif.
Tickets are $10 for adults, $5 for children and seniors. Tickets are available by calling the John Winthrop Middle School main office at (860) 526-9546. 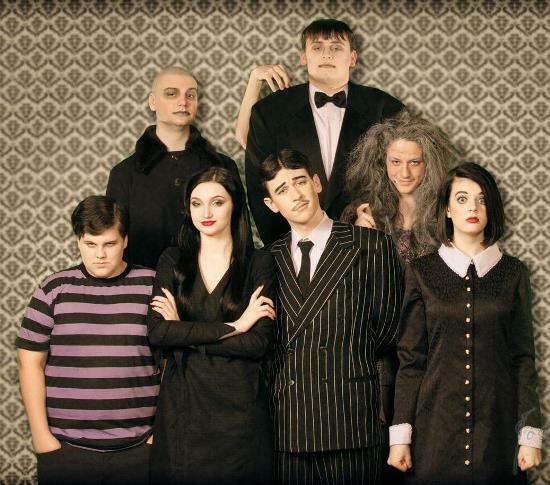 Starring in The Addams Family at Valley Regional: front row (L-R): Jonny Leffingwell, Miranda Holland, Nathan Russo and Maggie Walsh; back: James D’Amico, Zane Bouregy, Mitch Conrad and Annie Brown. Photo by Joseph’s Photography. REGION 4 — The countdown to show time has begun. This year’s musical at Valley Regional High School in Deep River is The Addams Family and it will open for the weekend from Friday, March 11, through Sunday, March 13, . This is one show that is not to be missed from the dancing and singing to the elaborate scenery, props, makeup and costumes. There are sure to be feelings of nostalgia for those who grew up watching this iconic show. Performances are offered on Friday and Saturday evenings at 7 p.m. and Saturday and Sunday afternoons at 1 p.m. Tickets are $12 each for all shows, except the Saturday matinee, which are $10 each. Tickets can be purchased at Celebrations, The Wheatmarket, Elephant Crossing, Toys Ahoy and at the high school. For further information, call the school at 860 526-5328 and ask for Tina Stoddard. REGION 4 – Patricia Cournoyer runs her “Getting Ready for Change” program for fourth and fifth grade girls and their female caregivers on Thursday, May 5, at 6:30 p.m. at John Winthrop Middle School library. This program costs $25 and admission is limited to 12 families. Please call Tri-Town Youth Services at 526-3600 to register. 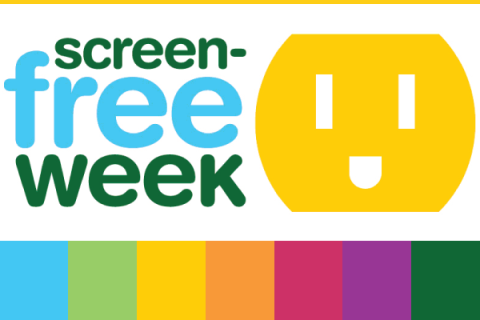 REGION 4 – To celebrate National Screen-Free Week, Tri-Town Youth Services is partnering with two local libraries to offer Screen-Free Family Fun. Young children and their parents are invited to the Ivoryton Public Library for free vision screenings and art activities inspired by Andy Warhol on Wednesday, May 4, from 3:30 to 5:30 p.m. The Essex Lions Club will conduct vision screenings with a sophisticated camera that can detect seven major eye deficiencies. Tri-Town Youth Services invites all kids ages five and up for crafting and storytelling with projects from the book, Show Me a Story, by Emily Neuburger. Gather at the Essex Public Library after school on Thursday, May 5, from 3:30 to 5:30 p.m. to make “story stones” and learn the art of bookbinding. The afternoon will wrap up with some collaborative storytelling fun. Both of these screen-free programs are free and open to the public. Call Tri-Town at 860-526-3600 for more information. 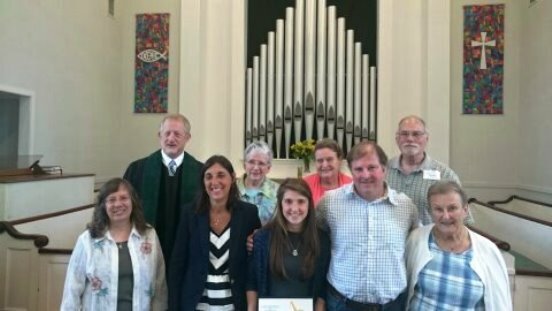 REGION 4 – Celebrated annually throughout Chester, Deep River and Essex, High on Life week will be observed May 1-7 this year as per the three selectpersons, Lauren Gister, Richard Smith and Norm Needleman, who signed the proclamation. Multiple sectors of the community contribute in various ways to make the substance abuse awareness and prevention week a success, including schools, the faith community, the business community and others. Events planned for the week are described in the High on Life brochures that are available in town halls, libraries, throughout the faith community, at Tri-Town Youth Services, and elsewhere. This year’s High on Life week is the 27th awareness week organized by Tri-Town Youth Services. While many “old favorites” such as window painting in Deep River will be featured, there are several new dimensions this year. 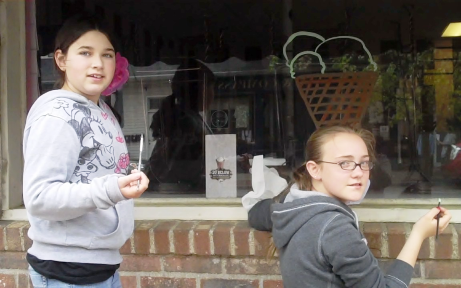 To celebrate High on Life 2011, Diana Carfi, Art Teacher at Deep River Elementary School, and sixth grade students painted windows at businesses along Main Street in Deep River. For the first time, there is a digital version of the High on Life brochure in addition to the printed version. The digital brochure can be accessed on Tri-Town’s website: www.tritownys.org. On Tuesday, May 3, Tri-Town Youth Services will host a free Community Coalition Breakfast/Town Hall Meeting at Camp Hazen YMCA in Chester, 8 to 9:30 a.m. Please call Tri-Town (860-526-3600) to register by April 8. 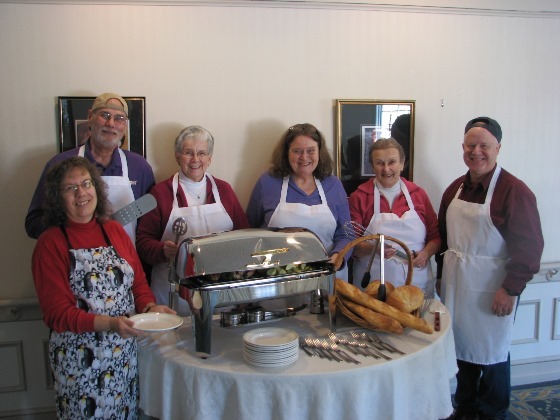 Members of the First Congregational Church who are preparing for the April 9 Pasta Supper and Open Mic Night are: (L-R) Delcie McGrath, Essex; Mike Hennessy, East Lyme; Emily Williams, Essex; Sharyn Nelson, Ivoryton; Mary-Lawrence Bickford, Essex; and Richard McGrath, Essex. ESSEX – The Second Annual Pasta Supper and Open Mic Night will be held on Saturday, April 9 at 6 p.m. at the First Congregational Church in Essex, 6 Methodist Hill in Essex Village. Sponsored by the church’s Justice and Witness Committee, proceeds from the event benefit the $1,000 “Making a Difference” Award, open to graduating seniors at Valley Regional High School (VRHS). For the all-you-can-eat supper, four choices of pasta with different sauces will be prepared by the church’s chef. Performers of all ages are welcome to showcase their talents at the Open Mic that follows the supper. Please contact Sharyn Nelson at 860-767-9817 if you would like to be included. Tickets are $10 for adults and $5 for children, if ordered in advance by calling the church at 860-767-8097. At the door, tickets are $12 for adults and $5 for children. 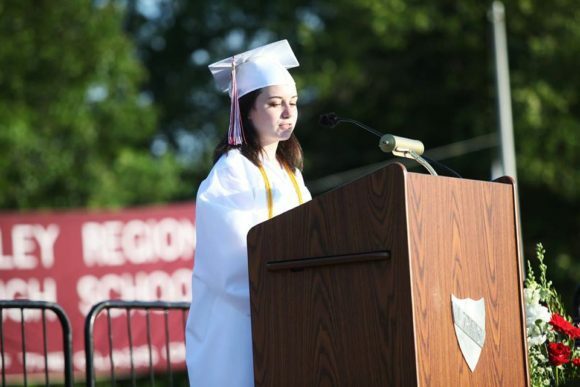 The “Making a Difference” Award is given to that graduating senior from VRHS whose actions continue to challenge those ideas and practices that result in the exclusion of others. 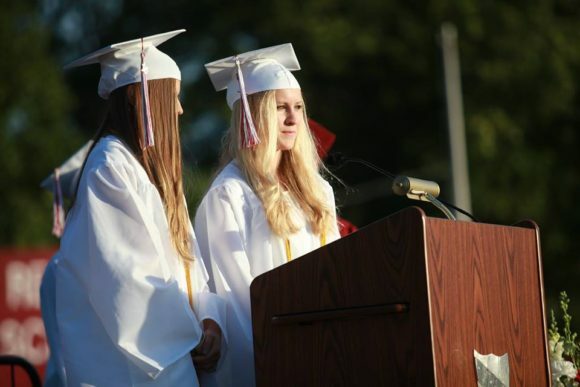 Award applications are available at the VRHS Counseling Office or at the First Congregational Church in Essex. The application deadline is April 30. For more information on the Pasta Supper or the “Making A Difference” Award, call the church at 860-767-8097. REGION 4 — On Jan. 7, 2016, the Region 4 Board of Education received the final audit of the 2014-15 school year that reflects a surplus of $53,350 at the close of the school year. Under a policy adopted last year, the Region 4 Board voted to return 50 percent of the surplus to the member towns and apply the other 50 percent toward capital sinking funds. TRI-TOWN — The Tri-Town Substance Abuse Prevention Coalition will hold its next meeting at Tri-Town Youth Services at 9 a.m. on Wednesday, Jan. 20. The Tri-Town Substance Abuse Prevention Coalition is a grassroots organization whose membership is open to all who live or work in the tri-town area who are concerned about substance abuse and committed to its prevention. Many “sectors” of the community are represented on this council: schools, youth serving organizations, law enforcement, government, civic groups, parents, students, the faith community and health care to name a few. At the January meeting, Deep River Resident Trooper Dawn Taylor will present on current drug trends in our area. Future meeting dates for this year are March, 9, and May 18. For further information, please call Tri-Town at 860-526-3600. REGION 4 – They’re creepy and they’re kooky! 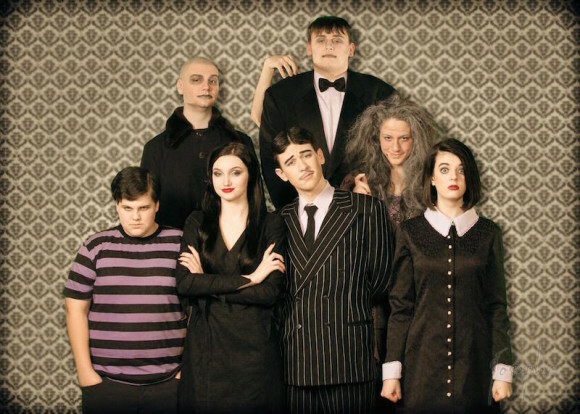 This year’s musical, The Addams Family, will be performed the weekend of Friday, March 11, through Sunday, March 13, at Valley Regional High School in Deep River. The cast, crew and pit are putting the finishing touches on staging, lights and songs as they prepare for opening night. Ingrid Walsh, director, comments, “I’m just speechless and so proud of how much and how far the cast has dared to go to join the Addams Family. From the dancing and singing to the elaborate scenery, props, makeup and costumes, this is one show that is not to be missed. There are sure to be feelings of nostalgia for those who grew up watching this iconic show. Performances are offered on Friday and Saturday evenings at 7 p.m. and Saturday and Sunday afternoons at 1 p.m. Tickets are $12 each for all shows, except the Saturday matinee ($10). They can be purchased at Celebrations, The Wheatmarket, Elephant Crossing, Toys Ahoy and Valley Regional. 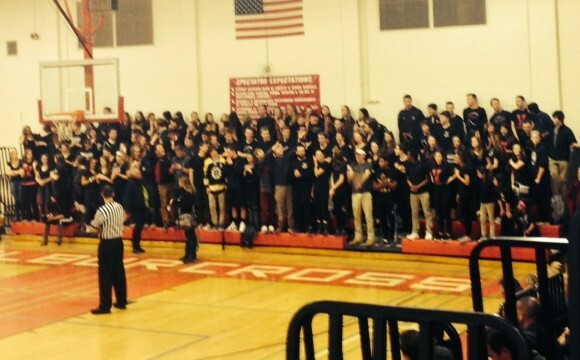 Those with questions can call the school at 860-526-5328 and speak with Tina Stoddard. AREAWIDE — If you have some time to volunteer to build a stronger community and help a local non-profit in tutoring area residents to read, write and speak English, you can start helping almost immediately. Literacy Volunteers Valley Shore is looking for board members, a treasurer for the organization, tutor trainees and volunteers. For more information, contact info@vsliteracy.org or call 860-399-0280. AREAWIDE — Tri Town Youth Services, in collaboration with Community Performance International, will be holding local auditions for non-union actors for their original production, ‘What Got Me Through,’ on Monday, Aug. 10 from 3 to 8 p.m. at Chester Meeting House. ‘What Got Me Through’ tells the stories of tri-town’s own residents — their challenges, victories, heartbreaks and resilience — in a one-act play that takes us through the lives of a Vietnam veteran experiencing PTSD, an unwed mother during the tumultuous post-war years of the fifties, survivors of fires — both physical and those that burn from within — as well as the deep, close bonds of friendship and family that hold fast through generations. ‘What Got Me Through’ is the uplifting tale of Tri-Town’s ordinary people doing extraordinary things. Auditions are open to actors of all ages, children and adults. Final performances will be at Chester Meeting House on Oct. 2, 3 and 4. Call Gail or Cate at Tri Town Youth Services, 860-526-3600, for more information. 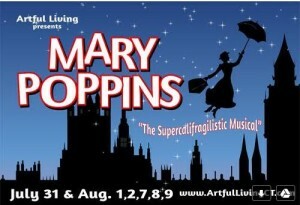 AREAWIDE — Artful Living has announced its 2015 Summer Musical, Mary Poppins, to be performed July 31 and Aug. 1, 2, 7, 8 and 9 at 7:30 p.m. on Fridays and Saturdays and 2 p.m. on Sundays. The show will be performed at Haddan-Killingworth Middle School at 451 Rte. 81, Killingworth in a state of the art fully accessible, fully air-conditioned theater. Mary Poppins is one of the most popular Disney movies of all time and is now capturing hearts in a whole new way – as a hit musical! sCome experience the enchanting mixture of irresistible story and unforgettable tunes. It features all the classic songs “A Spoonful of Sugar,” “Chim Chim Cher-ee” “Step In Time” and “Supercalifragilisticexpialidocious” to name a few- plus wonderful new music! See over 100 adults and children from all over the state come together to create the magic of Mary Poppins. Enjoy this beloved score with a full professional orchestra. Questions? Want to book a group? Call producer Chris Solimene at 860-389-1363. Louisa Ketron, a member of the Board of Trustees of Essex Winter Series, presented the Francis Bealey Memorial Scholarship to VRHS senior Daniel Leffingwell. 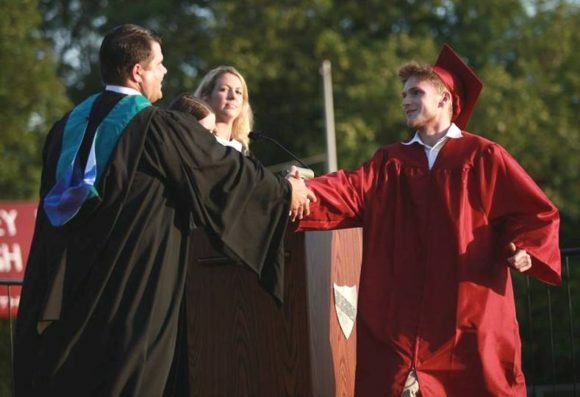 REGION 4 — Daniel Leffingwell of Chester, a senior at Valley Regional High School (VRHS), is the recipient of the 2015 Francis Bealey Memorial Scholarship, provided by Essex Winter Series (EWS). 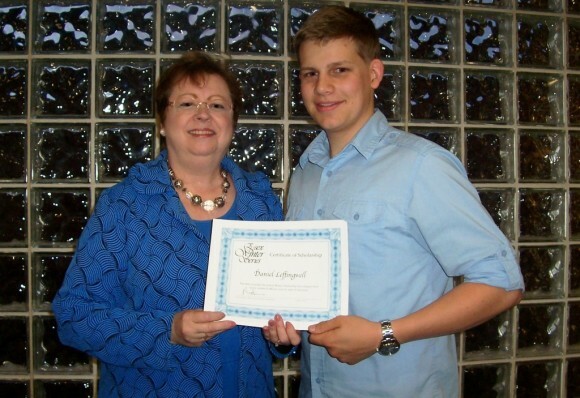 The scholarship was presented to Leffingwell by EWS trustee Louisa Ketron at the VRHS senior awards night on June 3. 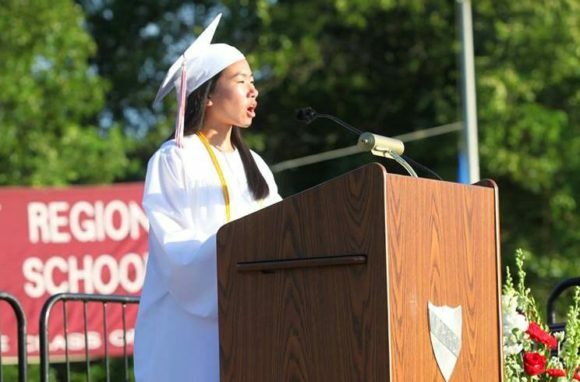 Named for one of the founding members of the EWS, the Francis Bealey Memorial Scholarship is awarded annually to a graduating senior of VRHS who will be studying music in college. The generous scholarship provides $1,000 for each year of study, for a total of $4,000. Leffingwell took part in drama, music, and sports programs throughout his career at VRHS. He participated in the school’s musical production, landing a lead role in his senior year. He sang in the school’s Concert Choir, the selective Madrigal Consort, and Madmen for all four years, and sang in the student-led a cappella group, serving as leader for one year. Also an instrumentalist, he played percussion in the school band and played bass and guitar in the jazz band. 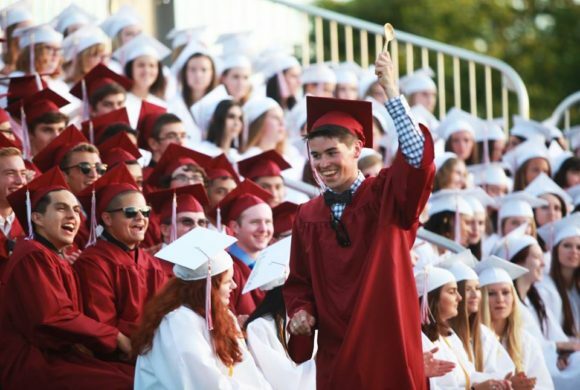 He was selected to participate in the All-State and New England music festivals for three years, elected to student council, and chosen for membership in the National Honor Society. In athletics, he played on the baseball and tennis teams. Laffingwell was highly recommended by members of the faculty, who noted he,“… is an extremely bright student both musically and academically,” “… a model student,” and “… a good young man who is interested in helping others as well as himself.” In the fall, Leffingwell will enroll at Trinity International University in Deerfield, Ill., where he will major in music education. The Francis Bealey Memorial Scholarship was established in 1995 after the passing of EWS board president Francis Bealey to honor his commitment to music and arts education. Bringing world-class classical and jazz music to the shoreline area was the dream of the founders of the EWS, established in 1979. The late Fenton Brown became involved early on and devoted many years to expanding the series, and ultimately recruited pianist Mihae Lee to become Artistic Director. The “Fenton Brown Emerging Artists Concert” series was begun to honor Brown’s commitment to promoting the careers of young artists. Each year, the EWS presents a series of concert performances by top-rated musicians from around the world. These concerts, held at Valley Regional High School or John Winthrop Middle School in Deep River, are presented on Sunday afternoons in January, February, and March. A single season may include a mix of such performances as chamber music, instrumental soloists, opera singers, symphony and chamber orchestras, and jazz bands. More information may be found at www.essexwinterseries.org. Region 4 summer reading books for middle and high school students. REGION 4 — John Winthrop and Valley Regional students from Chester, Deep River and Essex are invited to take part in the summer reading discussions at Chester Public Library to receive school credit. The discussion leader will be Sally Murray, who has been leading these popular discussions for several years. For John Winthrop students, the discussion will be on Thursday, July 16, at 5 p.m. “Turn Right at Machu Picchu: Rediscovering the Lost City One Step at a Time,” by Marc Adams, is the title to be discussed for summer credit. Refreshments will be served and each participant will receive a certificate of completion for their non-fiction requirement. On Thursday, Aug, 6, at 5 p.m., Valley Regional students are invited to discuss “172 Hours on the Moon” by Johan Harstad. Students who demonstrate that they have completed the book will receive credit for their fiction requirement. Food will be part of the fun. 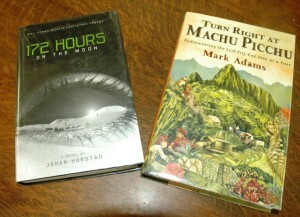 Copies of the books can be borrowed at the library. Registration at 860-526-0018 is required. 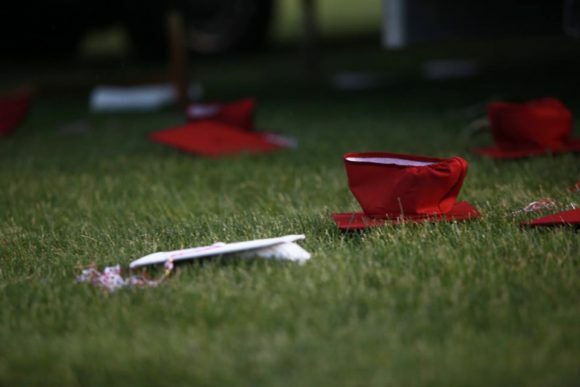 The VRHS Class of 2015 celebrates graduation with the traditional hat toss. Photo by J. Ferrucci. 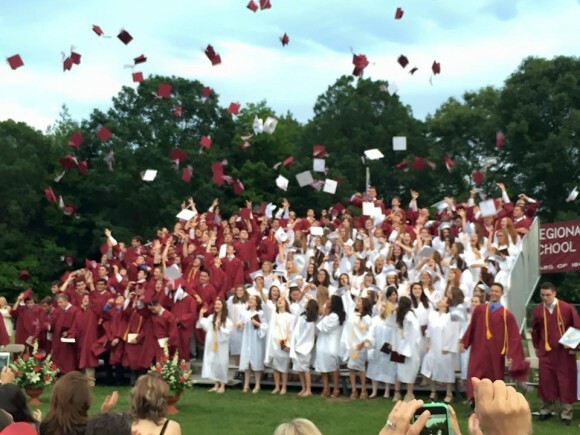 REGION 4 — Congratulations to the Valley Regional High School Class of 2015! at Tri-Town. Michael Fearon, fifth from left, stands with several members of his team. 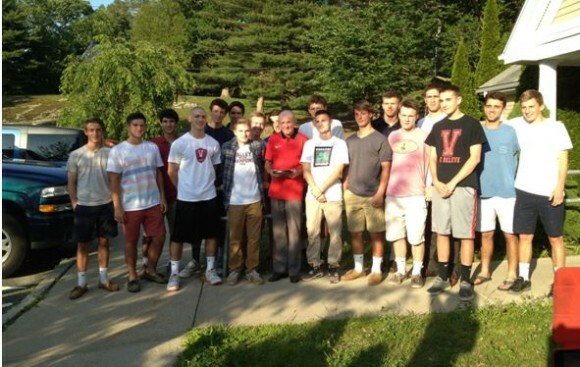 AREAWIDE — Tri-Town Youth Services recently presented their 2015 Generativity Award to Michael Fearon of Chester. Passionate about soccer, Mick Fearon has been coaching soccer for 40 years. He has been coaching high school soccer for 13years. In discussing the success records of his teams, Fearon says, “there are different levels of success.” He adds that kids often care about wins, but as a coach, he is concerned that the team is developing, players are improving and giving their best. He chooses to focus on the process, not the outcome. Fearon often attends his team members’ other activities, whether sports or the school musical, as he views them as whole people, not just soccer players and he wants to support them in their endeavors. Tri-Town Youth Services has presented a Generativity Award annually since 2005. Recipients of the award are people who, over time, have demonstrated an ongoing commitment to youth and have contributed significantly to building youth developmental assets. Previous awardees include: Marilyn Malcarne, Rick Stebbins, Pat Kosky, Jane Cavanaugh, Ingrid Walsh, Rev. Tim Haut, Linda Hall, Barbara Nidzgorski, Phil Miller, and Dr. Ruth Levy. Valley Regional High School’s (VRHS) Drama Program continues its tradition of performance excellence with the Valley Regional Musical Production (VRMP) of “Band Geeks,” receiving two notable awards, including the brand new ‘The Future of Theatre Award’ and the ‘Outstanding Graphic Design Award’ on June 1, at the Connecticut High School Music Theatre Awards gala held at the Palace Theatre in Waterbury, Conn.
Chris LeQuire and Brad Pitman of VHRS – assisted in creating newscast footage that tied the whole thing together to the end. 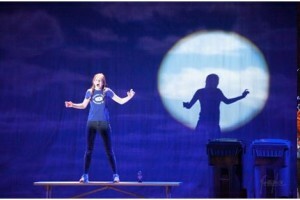 One hundred and twenty-one students from VRHS were involved in cast, crew, and pit to produce the newly released musical. The involvement of students represents 20 percent of the entire school population, along with countless volunteer hours of the parents, teachers, and community direct commitment to this long-standing tradition of producing excellence in musicals in the Region 4 School District. As always, the five-performance date and times of the musical were sold out early in our community. As a surprise to all, the creators Tommy Newman and Gordon Greenberg of ‘Band Geeks’ drove in from New York City along with original Goodspeed Producers to view their final dress rehearsal in March. The students attended the June 1 black-tie Gala at the Palace Theatre in Waterbury and performed “Lost in the Brass” one last time. 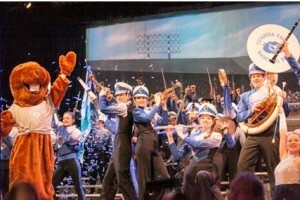 Valley Regional High School was among 20 other Connecticut high schools involved in the event, which celebrates high school music theatre. 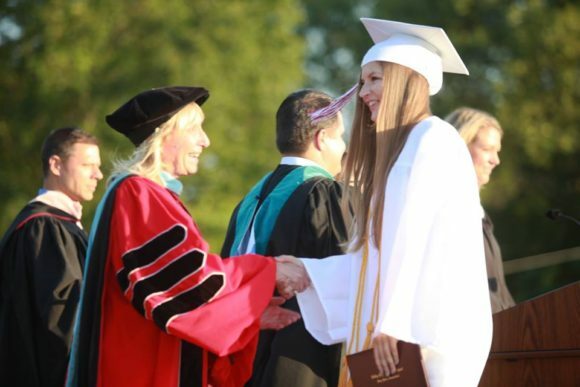 REGION 4 — The Region 4 Board of Education and Valley Regional High School (VRHS) has honored the Top Ten percent ranking seniors who have achieved outstanding scholastic records. A Senior Awards ceremony and reception was held Wednesday, June 3, in the VRHS auditorium. REGION 4 — A series of informal conversation for parents at elementary schools about Regionalization concludes Friday at Essex Elementary School Cafeteria from 8:30 a.m. – 10:30 a.m. Coffee and pastries will be provided. All are welcome. Superintendent Dr. Levy, the school principal and board of education will be available at the event for informal discussions. REGION 4 — The Valley Regional High School (VRHS) World Language Department organized a week-long trip to Paris over the 2015 spring break. A $1,300 grant from the Christopher Belfoure Memorial Fund at the Community Foundation of Middlesex County provided for the group’s transportation to John F. Kennedy airport in New York City for their flight to Paris. These funds were, as in years past, generated by the Run For Chris 5K, held annually in Essex in Belfoure’s memory. “Embark on your journey and only look forward. Not too fast but not too slow. It is the ones that remain idle that get lost in the memories of the past and not the dreams of the future. We as human-beings need to dream again once more.” These words were written by Chris Belfoure, pictured above, to his friend Valerie Tinker. Belfoure was just 24 when he tragically died in July 2011. 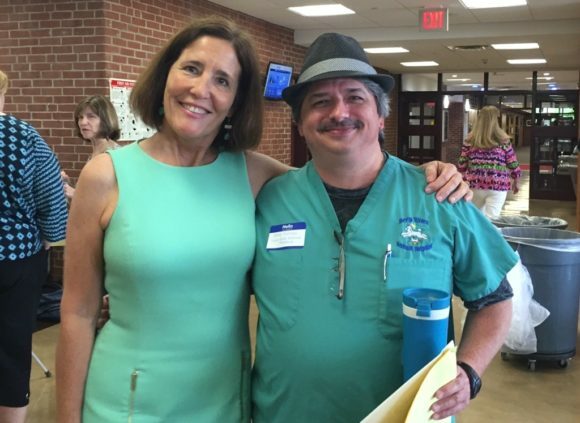 Yet his passions – his belief in the global community, his dedication to teaching and the environment – will be shared through the Chris Belfoure Memorial Fund at the Community Foundation of Middlesex County (CFMC). 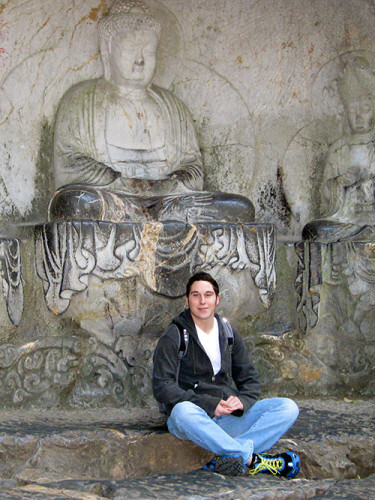 A graduate of VRHS and West Virginia University, Belfoure spoke fluent Mandarin and was pursuing a career as a corporate trainer in Shanghai. He is remembered as a charming, intelligent, ambitious man with a zest for life and adventure. Belfoure believed knowledge to be a bridge between cultures and a key in developing innovative approaches to education and customer service. He loved to talk and knew that overcoming the barriers of language provided people an opportunity to learn about one another, to share hopes and dreams, and that just by talking, one could encourage people to see themselves as members of a global community. Belfoure’s mother and stepfather, Robin and George Chapin, established the Chris Belfoure Memorial Fund at the Community Foundation in January 2012. This designated Fund supports Middlesex County-Lower County public schools and public library programs focused on integrating multicultural experiences, learning foreign languages, and environmental programs into the curricula. The Chapins and a host of family friends launched the Fund with the first annual Run for Chris – Run for Education on Saturday, June 23, 2012, in Essex; the proceeds were donated to the Chris Belfoure Memorial Fund. Editor’s Note: Information about and the photograph of Christopher Belfoure and the fund named after him have been taken from the Community Foundation of Middlesex County website. REGION 4— Region 4 school boards this week unanimously approved a reassignment of three administrators that was recommended by superintendent of Schools Ruth Levy after a retirement decision by one administrator. The changes that are effective in July 2015 will put different people in the positions of assistant superintendent and principals at Valley Regional High School and Chester Elementary School. Levy said Friday the moves were prompted by the decision of Assistant Superintendent Joanne Beekley to retire in June after a 38-year career in public education. 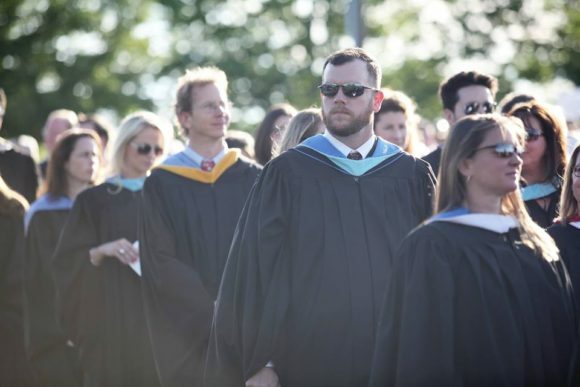 Beekley, a Haddam resident, assumed the assistant superintendent position in 2012 after six years as principal at Essex Elementary School, the largest of the three district elementary schools. Levy said after Beekley confirmed her plans at the beginning of the month, she began considering options that would allow the district to retain experienced administrators while also promoting from within the ranks of the current team. Levy said she met with the Region 4 Administrators Association, the bargaining unit for district administrators, and found support for her plan. Under the plan, Beekley will retire on June 30, but continue working for two years as principal at Chester Elementary School, the smallest of the three elementary schools. Kristina Martineau, principal at Valley Regional High School since 2010, will assume the position of assistant superintendent. 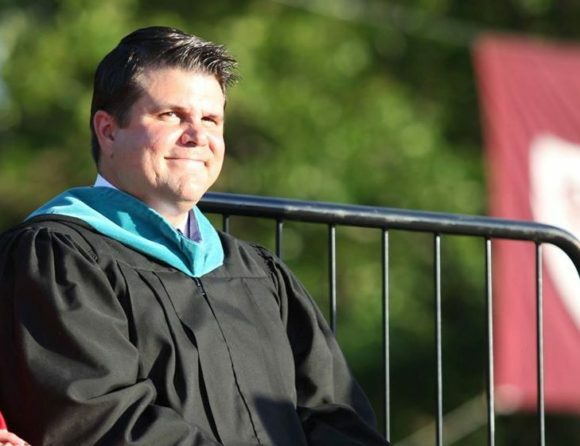 Michael Barile, a Haddam resident who has served as principal at Chester Elementary School since 2008, will become principal at Valley Regional High School. 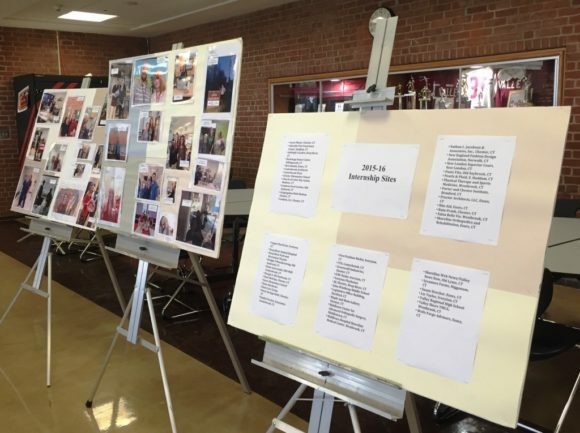 The reassignments prompted a series of special school board meetings this week, where the boards conducted closed door interviews before voting to approve the changes recommended by the superintendent. Levy advised district staff and the first selectmen of Chester, Deep River, and Essex of the changes on Tuesday. Levy said the reassignments will maintain continuity, while also allowing the district to move forward and give experienced administrators an opportunity to advance. She noted that each administrator will remain with the district and available to assist and mentor their successor. “This will provide a whole circle of support for one another,” Levy said. The Chester Board of Education will begin the process of hiring a successor for Beekley in 2017. CIAC Class S-Large Champs! Photo by W. Visgilio. Congratulations to coach Tim King and his Warriors on an incredible win! And here’s another link to great article about the game. 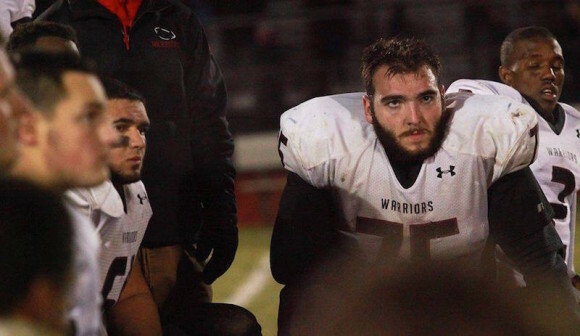 And, finally, here’s Tim Devlin’s video of all Saturday’s state game highlights. REGION 4— Region 4 schools open Thursday for the 2014-2015 academic year with two new administrators and 16 new teachers, along with a new system that provides a faster assessment of student performance in the classroom. The new student assessment system to be implemented at all five districts schools is from a national firm, Northwest Educational Association. It will provide teachers with a quicker assessment of student performance, allowing for a more timely information to guide instructional plans. A school breakfast program that began last spring at two elementary schools will be expanded to all five schools. A new system will also enable parents to pay for school breakfast and lunches on line. The new administrators are Christian Strickland, the new principal at Deep River Elementary School, and Sarah Smalley, new director pupil services. Strickland, a Middletown resident, worked previously as an assistant principal at an elementary school in Berlin. Smalley, an Old Lyme resident, is the former director of pupil services for Region 17 (Haddam-Killingworth) schools. Smalley worked previously in Region 4 as a special education teacher at Valley Regional High School. She is an elected member of the Region 18( Lyme-Old Lyme) Board of Education. 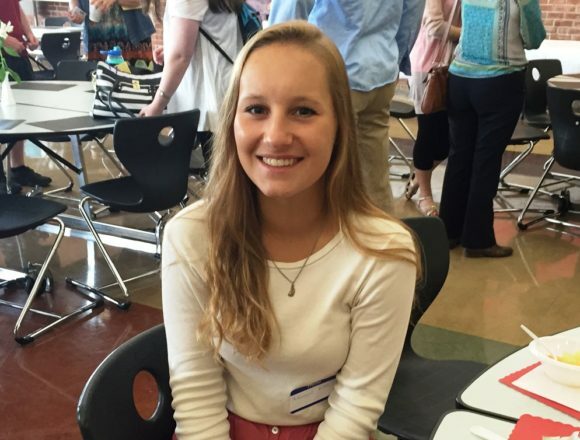 The highest number of new teachers is at the high school, where several long-time educators retired in June. 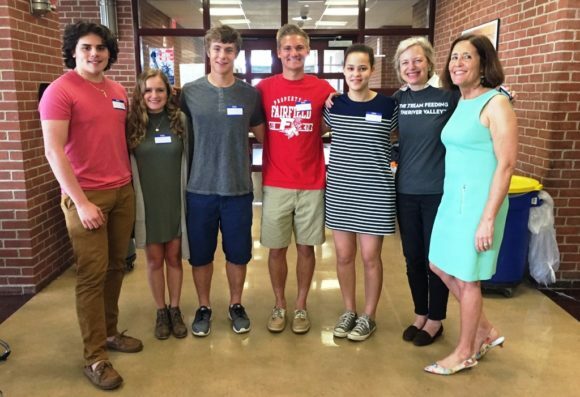 They include Mary O’Reilly-Spanish, Rachael Cassella-Spanish, Jill Esernia-English, Evan Soderholm- social studies, Augusta Ferretti-mathematics, John Kopcha- technology education, and Michael Naylor as a long-term substitute for physical education. The elementary schools for Deep River and Essex each have three new teachers. At Deep River Elementary School, there is third grade teacher Allyson Pitney, along with remedial reading and language arts teachers Andrea Ricci and Nicole Flynn. At Essex Elementary Schools, there is sixth grade teacher Erica Fleischman, kindergarten teacher Cynthis Breitenbach, and library/media specialist Renee Mitchill. Along with Smalley, there are three new teachers funded through the supervision district, technology integration specialist Kirsten Reynolds, and two special education teachers, Emily Dreher at Essex Elementary School, and Elise Johnson at Chester Elementary School Bethany Peters is a new para-educator at Chester Elementary School, and Mary Jane Maltezos is the new secretary to the principal at John Winthrop Middle School. 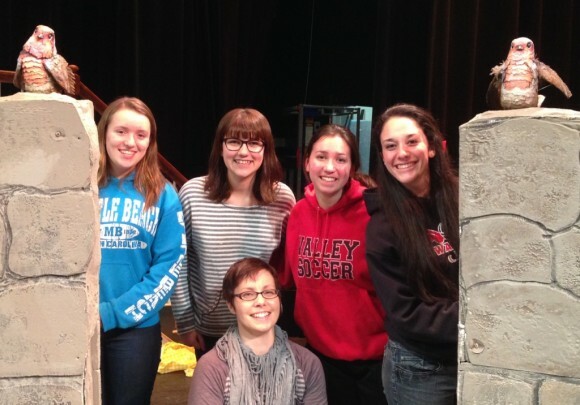 Valley Regional High School’s 2014 Production of The Secret Garden received 12 nominations for Connecticut High School Music Theater Award this year. The Award ceremony will take place at the black tie gala on Monday June 2, at the Palace Theater in Waterbury, CT. Good luck to all our nominees! ESSEX— A $23,056,963 combined town and schools budget plan for 2014-2015 won quick approval from voters Monday at the annual budget meeting. About 70 residents turned out for the meeting approving the budget on a voice vote with scattered opposing votes. The total spending package, which is up by 1.64 percent from the current total, includes a $7,202,161 town government budget, a $7,742,313 appropriation for Essex Elementary School, and the town’s $8,112,489 share of the Region 4 education budget. The Region 4 budget was approved in a May 6 referendum, with voters in Chester and Essex supporting the budget while a no vote carried in Deep River. The total spending package was approved at the meeting Monday without discussion, and no questions from the crowd on the property tax rate that will be required to support the spending. The board of finance is expected to set the tax rate for 2014-2015 at a meeting Thursday. The current tax rate is 18.99 mills, or $18,99 in tax for each $1,000 of assessed property value. An increase in the tax rate is required to cover a 7,72 percent drop in the grand list of taxable property that resulted from the townwide property revaluation completed last year. The revaluation resulted in a decrease in assessed values for most residential property owners. Tri-Town Youth Services recently presented its 2014 Generativity Award to Region 4 Superintendent of Schools, Ruth Levy. 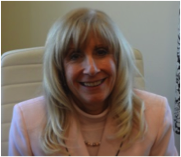 Dr. Levy has been with Region 4 Schools for eight years. During her initial three years, she served as Assistant Superintendent. REGION 4— Voters of Chester, Deep River and Essex approved the $18.37 million district education budget for 2014-2015 on a 319-253 vote in an eight-hour referendum Tuesday. The budget that funds the operation of Valley Regional High School and John Winthrop Middle School won voter approval in two of the three district towns, but was rejected by Deep River voters. The vote in Essex was 191-60 in favor of the budget. Chester voters approved the budget on a 59-37 vote. In Deep River, where a higher share of the budget is expected to lead to a 0.85 mill hike in the tax rate, voters opposed the spending plan on a 156-69 vote. The 66-vote margin for approval was much closer than last year, when the budget was approved on a 274-145 vote. The $18,377,431 budget represents a $601,431, or 3.38 percent, increased over current spending. The total budget is reduced by $297,447 in anticipated revenue to a net budget of $18,079,984 that is assessed taxpayers in each town depending on the number of students from the town attending the two secondary schools. The net budget is up by $579,395, or 3.31 percent. Each town had an increase in the Region 4 budget share, but Deep River had the largest increase of $442,063. Voter turnout for the annual referendum has been low and decreasing in recent years, but the total three-town vote of 572 was up from a turnout of 419 voters last year. A total of 619 voters participated in the 2012 referendum. The Chester, Deep River, Essex, and Region 4 Schools are pleased to announce the appointment of Ms. Sarah Smalley to the position of Director of Pupil Services. Ms. Smalley previously served as a special educator, Department Coordinator, and Interim Associate Principal at Valley Regional High School from 2003- through 2011. 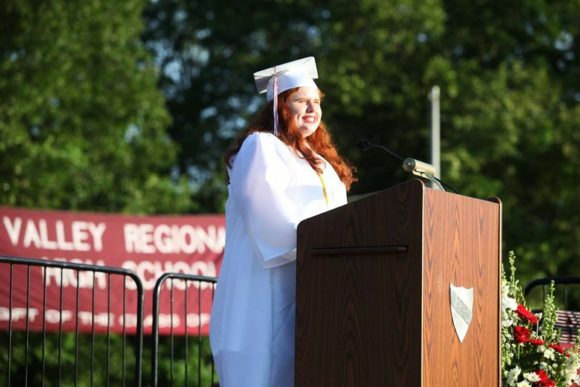 She served as Director of Pupil Services in New Hartford, CT, a Pre-Kindergarten through grade six school district. Ms. Smalley continued her administrative experience as the Supervisor of Pupil Services in Region 17, Haddam-Killingworth for the past two years. Ms. Smalley attended George Washington University for her Bachelors and Masters Degrees, and Sacred Heart University for her Sixth Year Degree in Educational Leadership. Ms. Smalley comes to us from a family of educators, and serves her community as a member of the Region 18, Lyme-Old Lyme Board of Education. We are pleased to welcome Sarah Smalley back home to our communities in her new position as Director of Pupil Services. Ms. Smalley will begin her post on July 1, 2014. ESSEX— The board of finance made no changes to a proposed $7.2 million town government budget and a proposed $7.74 appropriation for Essex Elementary School after a quiet budget hearing Thursday. About 25 residents turned out for the public hearing. There were no objections or calls for specific changes to the spending plans,despite an anticipated increase in the property tax rate that is largely driven by the results of a townwide property revaluation completed last year. The revaluation, the first for Essex since the start of the national Great Recession in 2008, resulted in a 7.72 percent drop in the grand list of taxable property that is used to establish a tax rate. The town government budget of $7,202,161 represents a $234,700, or 3.37 percent, spending increase over the current town government appropriation. The budget for the elementary school, $7,742,313, is up by $107,396, or 1.41 percent, from the current appropriation. The total spending levy for 2014-2015 also incudes the town’s $8,112,489 share of the Region 4 education budget that funds the operation of Valley Regional High School and John Winthrop Middle school. 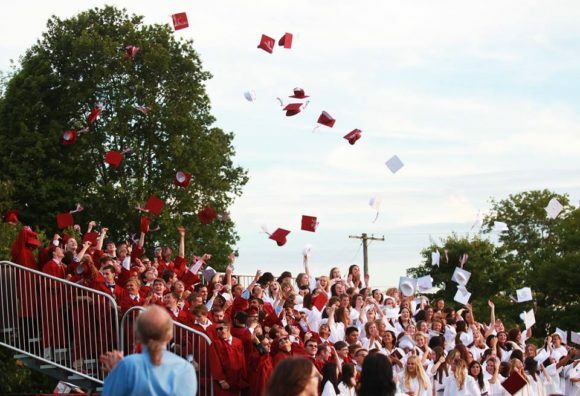 The Region 4 share is up by only $30,717, a much smaller increase than recent years because of a smaller rise in the number of students from Essex attending the two secondary schools. Former Selectman Vince Pacileo asked the key question of the budget hearing, specifically where would the spending plans put the town’s tax rate when the new fiscal year begins in July. The current tax rate is 18.99 mills, or $18.99 in tax for each $1,000 of assessed property value. The tax rate increased by 0.52 mills last year to current town/school spending. First Selectman Norman Needleman said a tax rate of 20.4 mills would be required under the new grand list to cover current 2013-2014 spending. With total requested new spending of $372,813, a slightly higher tax rate could be required for 2014-2015. Under the new grand list, a tax mill raises about $1 million in revenue. Pacileo also asked the expected total for the town’s undesignated fund balance at the start of the next fiscal year in July. Finance Director Kelly Sterner said the fund balance is expected to contain about $2.7 million. The town government and elementary school budgets are scheduled for a vote at the annual budget meeting on May 12, though residents could petition for an eight-hour referendum vote on these components of the budget. The Region 4 education budget goes to the voters of Chester, Deep River, and Essex in a 12 noon to 8 p.m. referendum on May 6. REGION 4— The Region 4 Board of Education will stand by it’s proposed $18,377,431 education budget for 2014-2015 after a quiet and sparsely attended public hearing Monday. Only three residents, all of them current or former officials from the district towns of Chester, Deep River and Essex turned out for the hearing Monday at John Winthrop Middle School. Present were two selectmen, Tom Englert of Chester and Dave Oliveria of Deep River, and former Region 4 board chairman Terry Stewart from Essex. There were no objections to the spending plan, which represents a $601,431, or 3.38 percent increase over the current budget. The budget funds the operations of the middle school and Valley Regional High School. 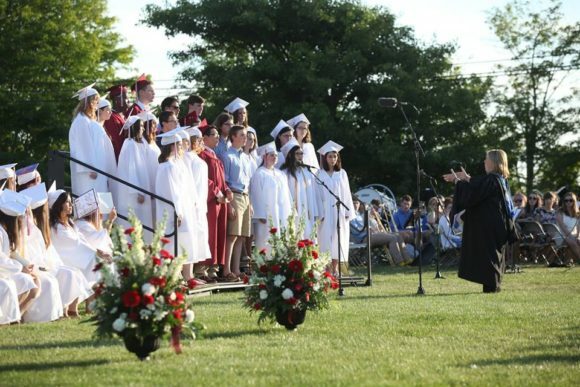 The $18,377,431 gross budget is reduced by $297,447 in anticipated revenue to a net budget of $18,079,984 that is assessed the taxpayers of the three towns based on the number of students from each town attending the two secondary schools. The net budget is up by $579,395, or 3.31 percent, from the current net billings to the towns. Each of the towns will have some increase in the Region 4 appropriation. 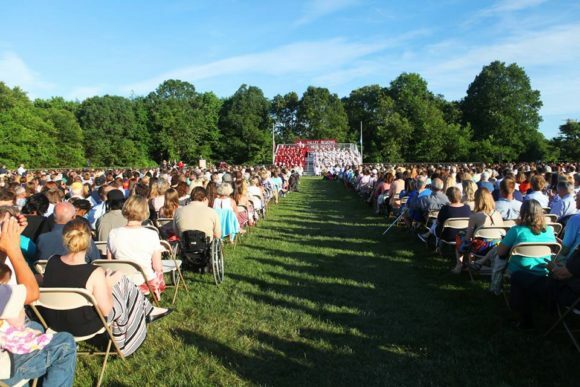 Deep River, with 308 students, will have the largest increase. The Deep River share of the net budget is $5,602,987, up by $442,063. Chester, with 240 students, will have a budget share of $4,364,508 that is up by $106,615.34 Essex pays the largest share of the Region 4 budget. 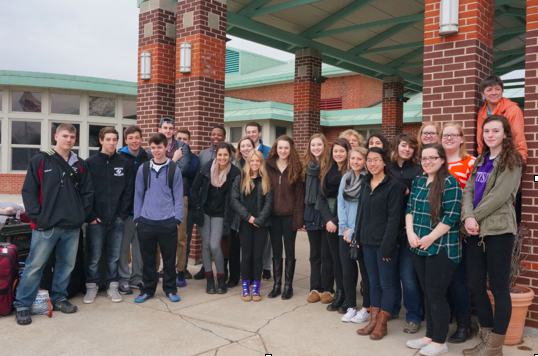 But 446 students, the town’s Region 4 assessment totals $8,112,489 and is up by only $30717 from the current amount. The budget goes to voters of the three towns in a 12 noon to 8 p.m. referendum on May 6. The region 4 budget has won voters approval by clear margins in recent years, but with low voter turnout. The last time a Region 4 budget was defeated in a referendum was in 2001. REGION 4— District elementary schools have begun offering breakfast to students in a grant-funded program that is expected to continue in future school years. The program began at the Chester and Deep River elementary schools on March 10, and started at Essex Elementary School this week. Superintendent of Schools Ruth Levy said Director of Food Services Thomas Peterlik determined there was federal funding available for a school breakfast program, and later secured nearly $3,000 in grant funds even though the current school year is now entering its final months. She said the program started first at the Chester and Deep River schools because those schools have a higher number of students received free or reduced price school lunches under federal guidelines, though school officials quickly determined there would be sufficient funding to extend the program to Essex Elementary School. Peterlik said this week he decided to keep the breakfast options simple in order to begin the program as quickly as possible and utilize the funding available for the current school year. Students are offered a brown bag breakfast before the start of classes at a price of $1.25. The breakfast includes fresh fruit and milk each day, while other items vary from cereal to yogurt, pastries, or bagels with cream cheese. Peterlik said student response over the past two weeks indicates the program would be a success. He said average daily participation since March 10 has been 39 students for Deep River and 29 students for Chester, with at least 27 students taking breakfast each day this week as the program was rolled out for Essex Elementary School. 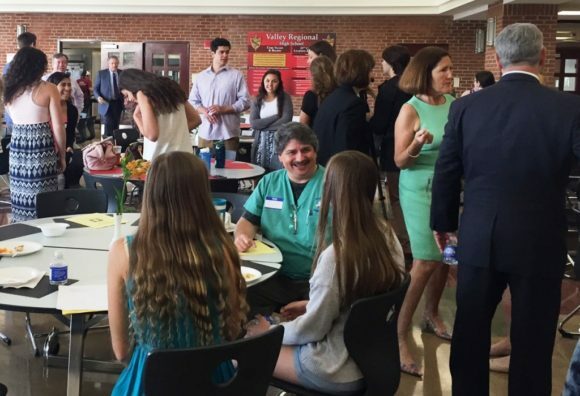 The district’s two secondary schools, John Winthrop Middle School and Valley Regional High School, had already offered breakfast for students and staff.